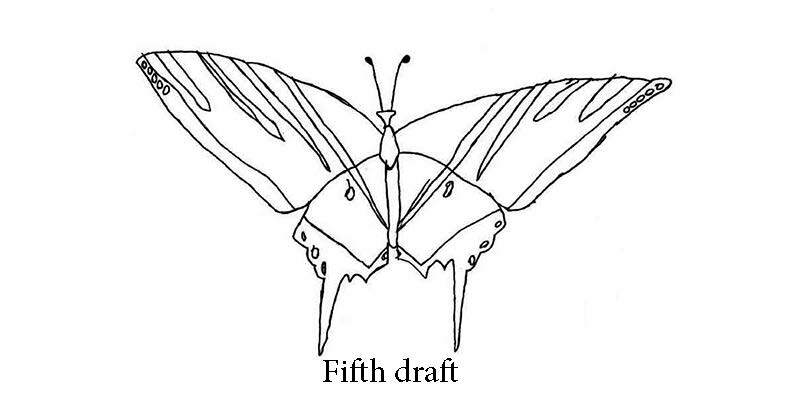 This series of drafts of a scientific illustration of a Western Tiger Swallowtail butterfly were drawn by Austin, a first grade student at Anser Charter School in Boise, Idaho. Anser Charter School has built a school culture where students create quality work for authentic audiences, and where students are used to getting feedback in a variety of critique settings to improve their work. For many years, Kindergartners in this school studied birds, and created beautiful note cards with a scientific illustration of a bird on the front of the card and information about the bird on the back. Those cards were printed on a quality cardstock, bundled in boxed sets and sold in the community and throughout the state, including at state rest stops on highways; all the profits were used to support preservation of bird habitats. Austin’s first grade class was inspired by this Kindergarten project and initiated a parallel project that year for their first grade study of butterflies. For his scientific study and note card, Austin chose this butterfly. Austin knew that his goal was an accurate, colored scientific illustration of this butterfly that could be used for identification. But he was still just a first grader, without sophisticated art and fine motor skills, and importantly, without much understanding of scientific illustration. 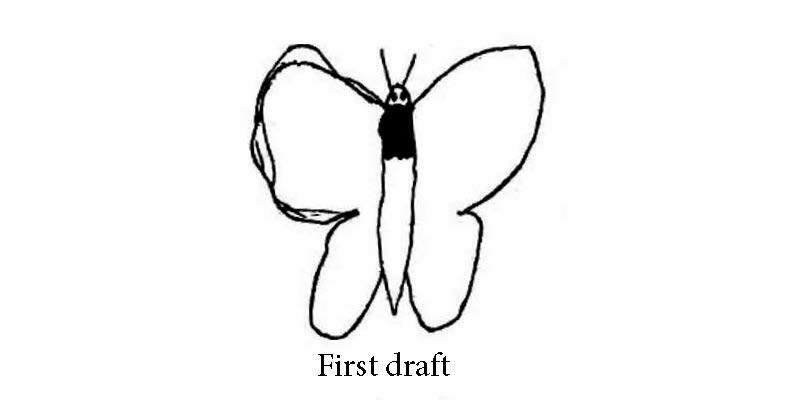 When he began his first draft, he looked at the photo, but then he put it aside when he took up his paper and he reverted to the icon of a butterfly that was in his head. Austin met on the carpet with a critique group facilitated by a teacher, and his drawing was posted next to the photograph. In this group, Austin and his peers were supported to begin to think like scientists – to observe carefully and record their observations – rather than just to create a drawing. Austin’s peers were asked to give him advice about how he could change his drawing to more closely resemble the photo. The critique was split into two phases – first students focused on wing shape; when the shape was correct, they moved onto wing pattern. The class had created rubrics for what quality would like in these two areas. Students were asked to be Helpful, Specific and Kind in their feedback. The other first graders looked carefully at the photo and suggested to Austin that he should make the wing shape more pointy, more triangular, and less round. 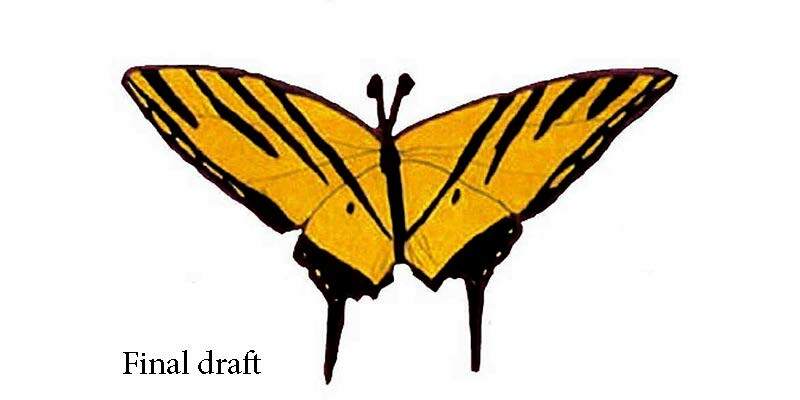 They also suggested he include the swallowtails – the extensions to the wing at the bottom. Austin was pleased to get the suggestions. 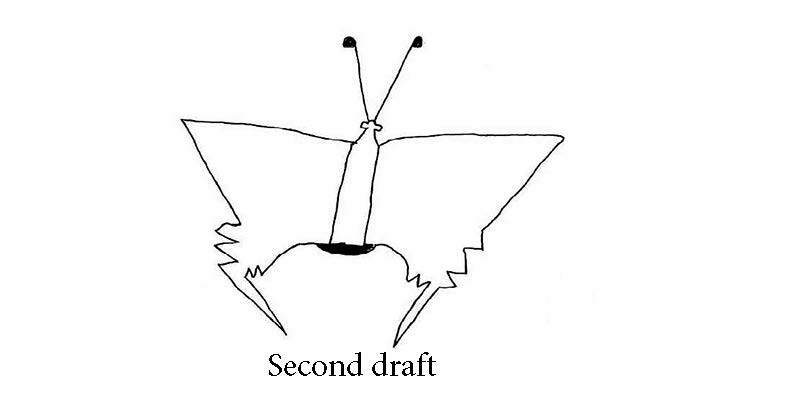 “OK”, he said, and as soon the critique ended he zoomed back to his table and created draft 2. During the next critique, the other first graders told Austin that this draft was much better! It was angular, and had the swallowtails. 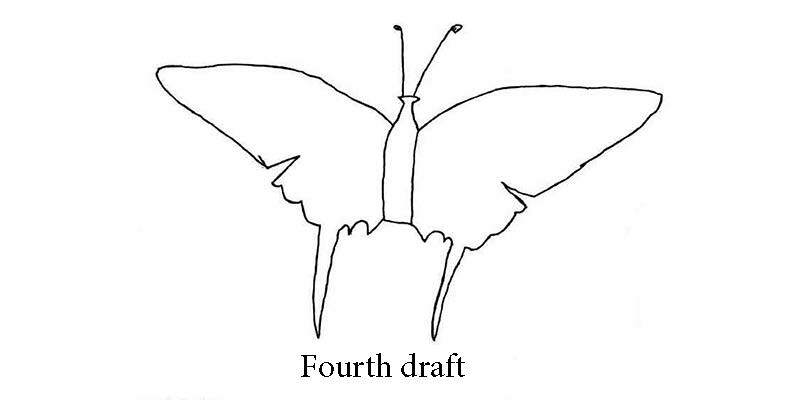 But they reminded him that on this draft he had forgotten that butterflies have an upper and lower wing on each side. 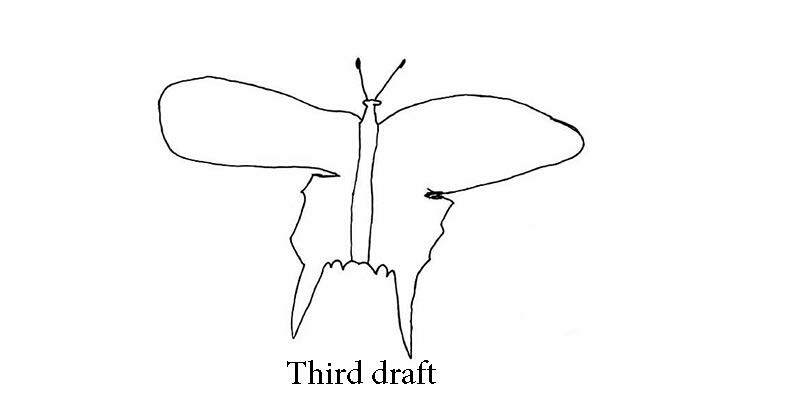 He went back to his desk and on his next draft produced this draft 3. The group praised Austin for making lots of progress. This looked great. But… the upper wing had gotten round again. The lower wing was fine, but he had to make the upper wing more angular again. He went back to his table and produced draft 4. Now the group said: “Austin, this is great! You’re ready for pattern!” He used his best scientist eyes and tried to copy the pattern, and produced draft 5. The group told Austin he was ready for color. He examined the photo and tried to match the color, and produced draft 6. This was the draft that was used for the card. It’s an example of beautiful work, and it also signifies the transformation of Austin from a little kid drawing to a beginning scientist. I can use drawings or other visual displays to help me express myself.